Holy rollers at the Church of 8 Wheels, Fillmore Street's premiere house of God-turned-roller-rink, are in for a treat. As Hoodline has the good word, the popular recreational spot is open again after some renovations and a stint rented out by Levi's for a TV spot. Now with smooth hardwood floors instead of trickier, bumpier linoleum tile, and newly unobscured views of a gorgeous ceiling (nets had previously been in the way), the Church is back in action. "The coolness factor is now off the scale to measure" David Miles Jr., who runs the wheeled "congregation," told Hoodline. While the renovations are no doubt a blessing, rollerskaters might want to get their last laps in soon. The 117-year-old Sacred Heart Church building at Fillmore and Fell could become a residential and commercial development according to previous Hoodline reporting. A Preliminary Project Assessment was filed last fall  but, of course, things like this take years in this town. 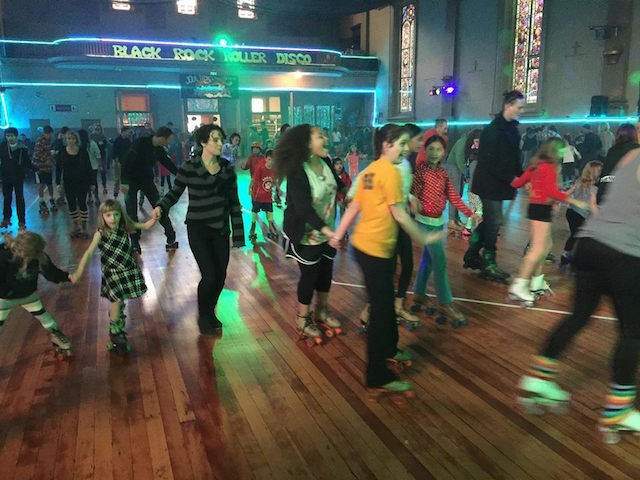 The Church of 8 Wheels is in session from 7 to 11 p.m. Friday and Saturday nights at 554 Fillmore Street.